It's important to setup a static IP address if you are planning on forwarding ports. When you setup port forwarding your router forwards ports to the IP address you specify. If you don't setup a static IP address the port forward will probably work the first time. But after restarting your computer it may use a different IP address. When this happens the ports are no longer forwarded to that computer's IP address. IP addresses are four sets of numbers that are separated by periods that allow computers to identify each other. Every computer on your network has at least one ip address. Two computers on the same network should never have the same IP Address. If two computers end up with the same IP address neither will be able to connect to the Internet. There is a lot of information at the following link. If you want to know more about how networks work check out the information here. Your router most likely assigns dynamic IP addresses by default. Routers do this because having a dynamic IP address network requires no configuration on your part. You can simply plug in your computer and the network will work. When IP addresses are assigned dynamically, it is the router's job to assign them. Every time a computer reboots it asks the router for an IP address. The router then hands the computer an IP address that has not already been handed out to another computer. This is a very important because when you set your computer to a static IP address, the router doesn't know that a computer is already using that IP address. That same IP address could be handed out to another computer later on. This will prevent both computers from connecting to the Internet. It's important to assign an IP address that will not be handed out to a different computer by the dynamic IP address server. The dynamic IP address server is generally referred to as the DHCP server. Tip: Print this page before you begin. 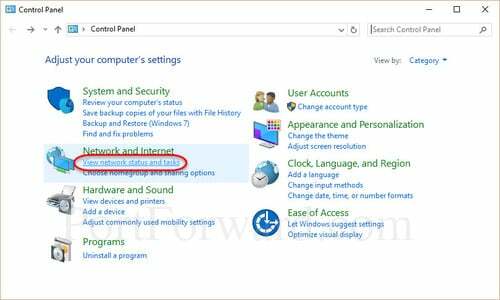 Open up the Windows 10 start menu by pressing the Windows key on your keyboard. You can also open this menu by clicking the windows icon in the lower left corner of your screen. When the start menu appears simply type cmd on your keyboard and press enter. A window similar to the one you see above should appear on your screen. It's okay if it doesn't look exactly like the one you see above. In this window you need to type ipconfig /all and press enter. There are three things I want you to write down from the window. Write down the IPv4 address, Subnet Mask, and the DNS Servers. Make sure to note which is which. You will need this information a little later. 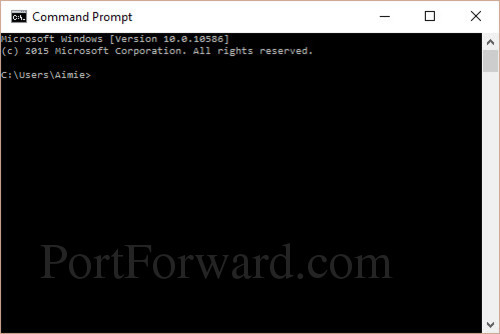 Type exit and press enter to close the command prompt. Note: If your DNS Servers listed the same IP address as your Default Gateway, read the following! The DNS server (Domain Name System) server can get a bit complicated. Some router's act as an intermediary between for the actual DNS servers and your computer. If this is the case your Default Gateway will list the same IP address as the DNS Servers entry. We need to have the correct DNS Server IP addresses not the Default Gateway. You will not be able to use the Internet if we don't find out what your actual DNS servers are. There are a couple different ways to find these. The first way is to log into your router's web interface and look at your router's status page. On that page you should see an entry for DNS Servers, or Name Servers. Write down the IP addresses of these DNS Servers. Another way to find out what the correct DNS Servers to use, is to call your local Internet Service Provider or ISP. They should know the IP addresses of your DNS Servers right away. If they ask you why you need them, simply tell them you are trying to setup a static IP address on your computer. If they try to sell you a static external IP address, don't buy it. That's an entirely different thing than what you are trying to setup here. Once again open the Windows 10 start menu by pressing the windows key on your keyboard. This time type the words Control Panel and press enter. Click the link titled View network status and tasks under the Network and Internet heading. Click the link on the left of the window labeled Change adapter settings. You might have more than one Internet connection listed in this window. If this is the case you'll need to determine which one is your connection to the Internet. 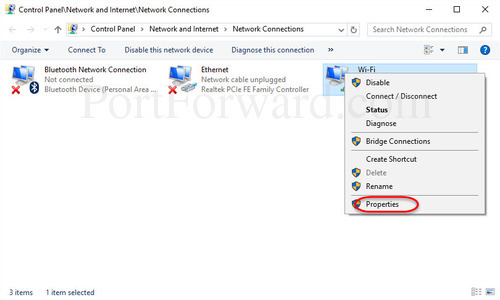 Once you have found it, right click on your network adapter and choose properties to open up the properties window of this Internet connection. 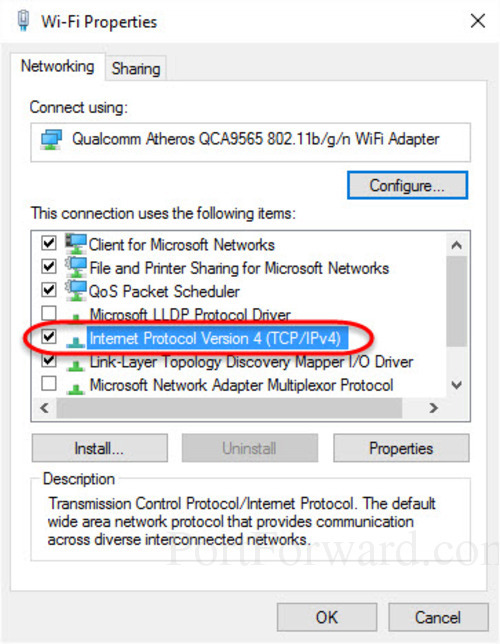 Find the option of Internet Protocol Version 4 (TCP/IPv4) and click on it. Then choose the option under that titled Properties. You should now see a screen similar to the one you see above. Before making any changes you should write down all the settings you see in this window. This is in case something goes wrong you can simply put it back the way it was. Like the image above you should see a dot in the circle next to Obtain an IP address automatically. If not, then you are already setup for a static IP address. Simply close this window because you are done. If your screen looks like the one above then you need to choose a static IP address to use for this computer. 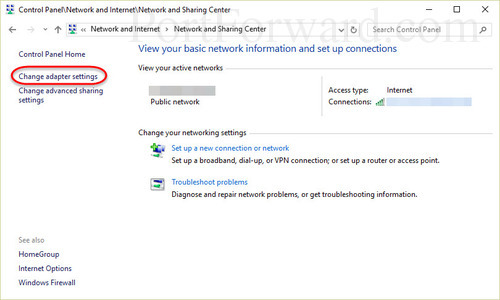 First, click the circle next to Use the following IP address:. Then enter a new IP address in the box labeled IP address. This address needs to be similar to the router's IP address. Just make sure the last number is different. 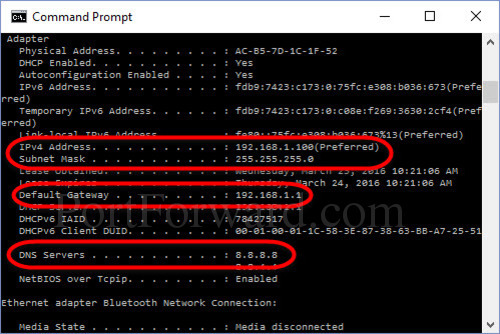 For example if your router's IP address is 192.168.1.1 then maybe you choose 192.168.1.10 This new IP address should end between the number 1 and 254. It should not be the same as your router's IP address. Every device on your network needs to have it's own IP address or neither device will be able to connect to the Internet. Remember those numbers you wrote down from the command prompt window? Time to use those. Enter the Subnet Mask you wrote down in the Subnet mask box. The Default Gateway number should go into the Default gateway box. Finally, enter the DNS Servers you found into the two DNS Server boxes. If after doing this you find you can't use the Internet it is probably the DNS servers you wrote down. Give your ISP a call and ask them what DNS servers to use. They get this question all the time and should be able to give you an answer right away. That's it, you did it. If you still find you are having problems getting on the Internet you can always go back and put everything back to how it was originally.